The Tennessee Emergency Management Agency (TEMA) declared a State of Emergency at 7:15 a.m., CDT, this morning, July 7, 2016, due to flash flooding in a number of Middle Tennessee counties from heavy rainfall overnight. Locally heavy rainfall, up to eight inches in some locations, has impacted Cheatham, Davidson, Macon, Montgomery, Robertson, Stewart, Sumner, and Trousdale counties. Flash flood warnings will remain in effect throughout Middle Tennessee as another one inch of rain is expected over the area today. 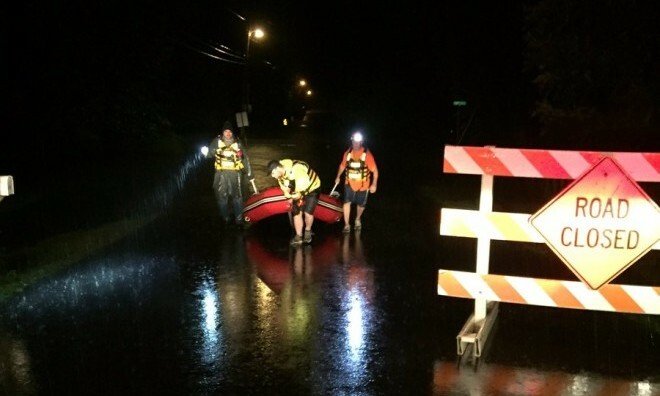 Local responders conducted swift water rescues in Stewart, Sumner, and Robertson counties as flood waters inundated homes and roadways. County emergency management agencies in Davidson, Montgomery, and Trousdale, reported downed trees and impassable roads. There are no reports of fatalities, injuries from the severe flooding but emergency management officials are warning local residents to use caution if they encounter high water – Turn Around! Don’t Drown! TEMA has deployed District Coordinators to assist county emergency managers with any coordination or requests for resources. • Highway 41A at Eva Drive in Clarksville closed due to flooding. The State Emergency Operations Center in Nashville is activated with representatives from the American Red Cross, the Tennessee Department of Health, Tennessee Department of Transportation, Tennessee Highway Patrol, and Tennessee Voluntary Organizations Active in Disaster. Agencies will be monitoring the ongoing weather situation and assisting counties and other State partners with requests for assistance.